Not so great when the side walk pops up. Pain in the neck when they approach the garden and the rotor tiler jumps and jerks. Dare I say when the hair line goes multi colored... dark strips appearing and or white blazing. Fantastic when talking to children about heritage. Smile grabbers when Bases, Posts, Stations, Aux Fields are mentioned on FaceBook. Over the top when pictures crash in on emotions and you are reminded of loved ones who have gone on before us. And tangible root/heritage articles of art, clothing or holiday are just plain fun to have! 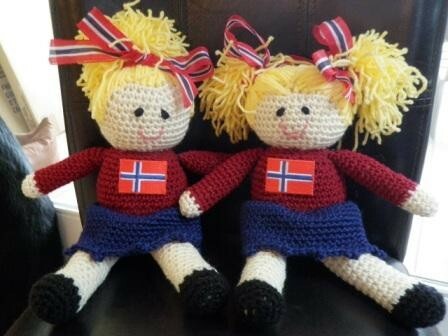 Have any Scandinavian in you? Ja sure you betcha! Visit Tracy's Page. It is a smile popping page! -- A stack of 11x17 landscape prints from a friend who is a professional photographer. -- A peppy comforter and matching curtains sewn to fit the dimensions of my trailer window. Also, a new sheet set and a foam mattress pad to make my bed more comfortable. -- A mini-rice maker and a bag of rice helped me stay healthy by enabling me to skip occasional meals at the all-you-can-eat dining hall. Just-add-boiling-water meals were nice, too. -- Good books friends and family members back in the States had recently read. I discovered several great books by authors that I might not have otherwise picked up and it gave me something interesting to discuss in letters and e-mails. -- Ground coffee from my favorite coffee roaster in San Diego. -- Fashion magazines and current newspapers from back home. -- Fancy shampoos, lotions and soaps. -- Decorations for the holidays, including the minor holidays, like a small pumpkin for Halloween. -- Blank cards for sending thank you notes. Sending a care package to your loved one not only shows you love them but it is an important part of staying connected. We have tons of ideas for you! What are some of your favorite ideas? resources? home-made items that were a success and store bought items that were a touch of home? "He said one of the best things people can 'send' is to make contributions to the USO. Apparently, they put on some pretty good programs for their battalion and entire base. He would like to see them continued. Between the USO and MWR they have some really entertaining programs (small and large) that help their time pass a little faster." Family ... it can have a lot of meanings. Moms, Dads, Children, Aunts, Uncles, Grandparents, Nieces, Nephews, Cousins. All are family... and over the past couple weeks I have seen them. Hugged them. Cherished them. We spent time at my folks' house, over the river and through the woods. (It is not a road trip of epic miles ... but with a family of six it can be a few hours, a bit of "Are we there yet? ", and quite a few "MOM, I have to go to the bathroom!"s. While we were at Mom and Dad's the grandchildren put on their own nativity scene, we ate /too/ much (always happens with my mom's cooking), and we laughed a whole lot! We spent time with Hub's family and when I say family I mean FAMILY. 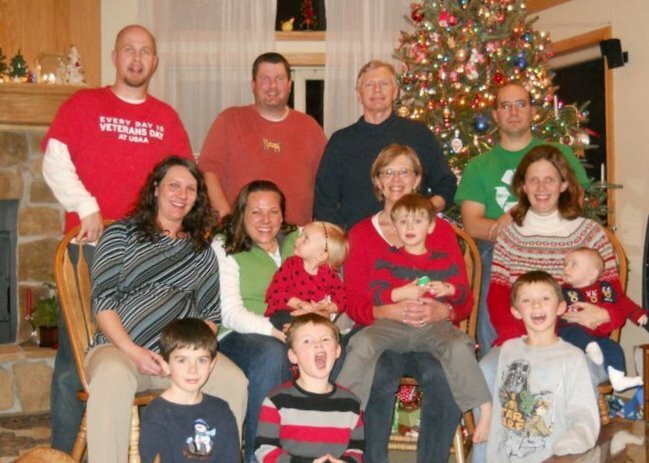 Aunts, Uncles, Cousins, 2nd Cousins, Great-Aunts & Uncles, all crammed into Grandma's modest-home. But it was wonderful and jam packed with tradition! Santa stopped by and generations of children were amazed, once again, that he would take time from his busy Christmas Eve to bring each of them a gift. We laughed, caught up, and then hurried home to bed so that Santa could do his thing. But there was another very important family we spent time with. My church family. My brothers and sisters in Christ. The small-group I looked at last month and said would you be in special prayer for Baby Boy *L*, like a family of godparents. The folks that helped me through deployment, the adults who want to spend time with my children, the group that I look forward to getting together with every week. 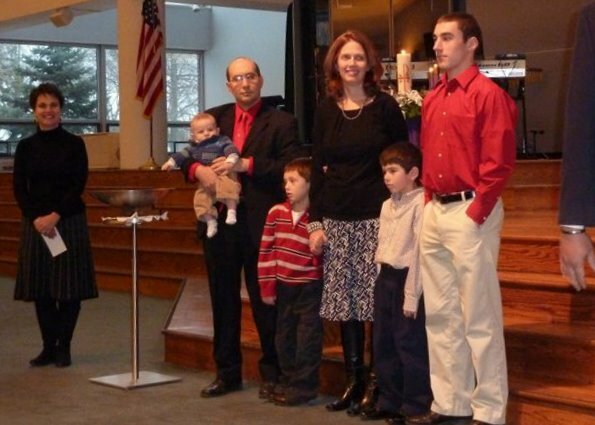 *L* was baptized on Sunday, the 26th. What a CRAZY time of year to be preparing for a party. Yet, as I stood in front of the church Sunday morning with hubs, proclaiming that 'Yes, we will raise our child to love and know Christ.' I looked out at the congregation and saw my family, hub's family and off to the left was my small-group family. I had such a sense of overwhelming love and belonging. It was a /wonderful/ culmination of the Christmas Season. And put a whole new meaning to the Reason for the Season. We all have our own definition of family. It could include your neighbors, your own church family, very special friends in your unit or battalion. People you turn to when you need support. I hope you got to spend some time with them this holiday season! Have you ever looked at something year after year and yet never seen something, a treasure within an article? Each year this has been our Christmas breakfast. From the look of the page that has this cut out pasted upon it, you can tell it is a loved article. 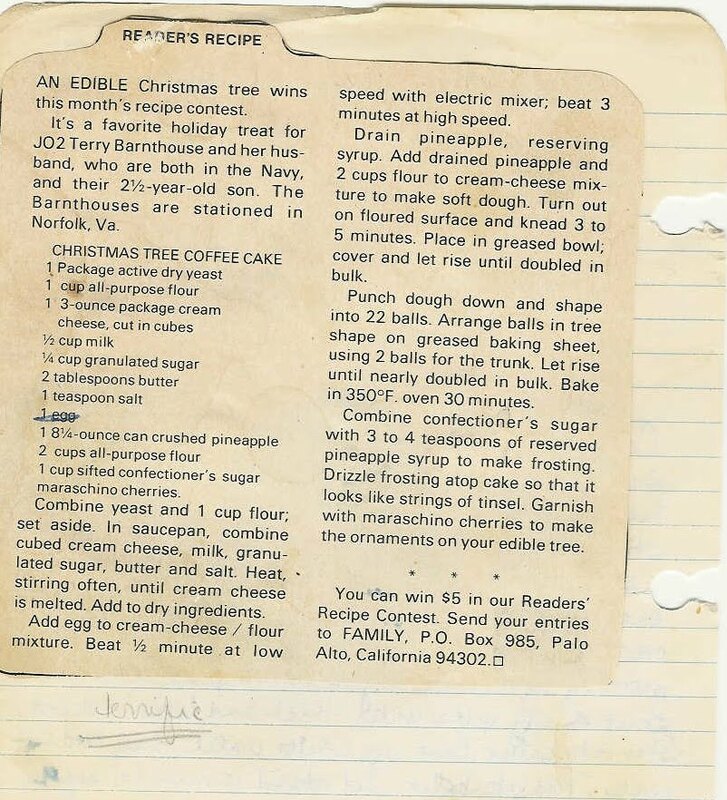 I cut the edible Christmas tree recipe out of a commissary handout over 31 years ago! And use it every year. This year I read the first two paragraphs and burst out laughing. The wonderful lady who sent this in was stationed with us in Iceland 20 years ago. At that time her son was in high school with our son and daughter. 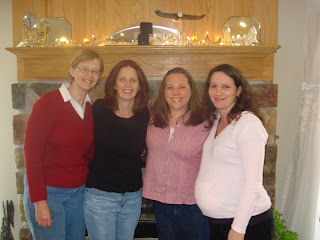 Part of a close knit group of friends who are Facebook buddies now. Oh how I love the small world of the military. I hope you find joy in the little things of life today and every day! Merry Christmas, happy holidays and a fantastic 2011~! Combine yeast and 1 c flour, set aside. In saucepan, combine cubed cream cheese, milk sugar, butter and salt. Heat stirring often, until cream cheese is melted. Add to dry ingredients. Add egg (optional) to cream cheese/ flour mixture. Beat 1/2 minute at low with electric mixer; beat 3 minutes at high speed. Drain pineapple, reserving syrup. Add drained pineapple and 2 c flour to cream cheese mixture to make a soft dough. Turn out on floured surface and knead 3 to 5 minutes. Place in greased bowl; cover and let rise until doubled in bulk. Punch dough down and shape into 22 ball. Arrange balls in tree shape on greased baking sheet, suing 2 balls for the trunk. Let rise until nearly doubled in bulk. Bake in 350 degree oven 30 minutes. 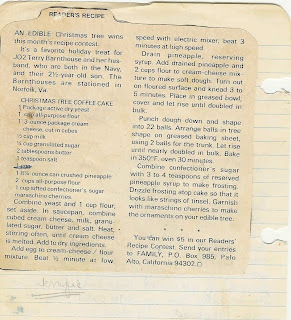 Combine confectioner's sugar with 3 to 4 t. of reserved pineapple syrup to make frosting. Drizzle frosting on cake to make it look like garland. Garnish with maraschino cherries to make the appearance of ornaments for the edible tree if desired. The Jolly Green Giant Arrives! This week has been hectic! 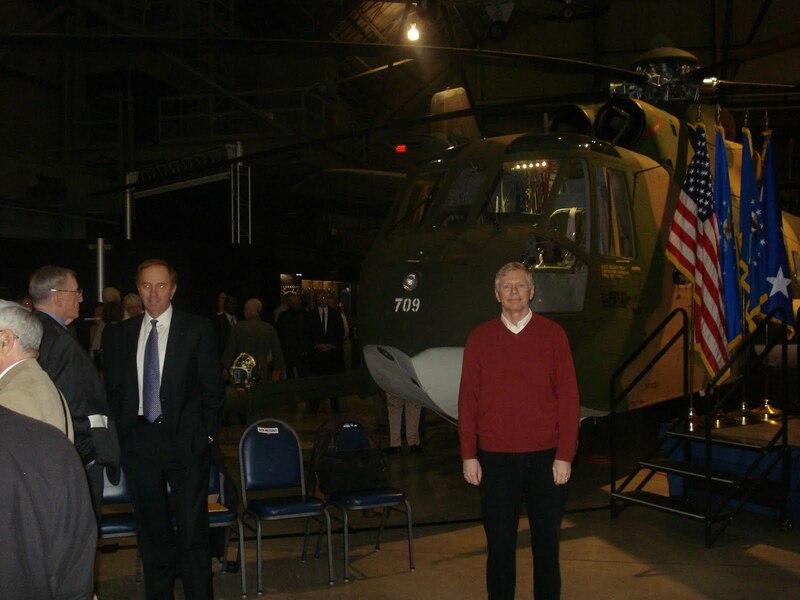 We traveled to see family for a Christmas gathering and then headed south to Wright Patterson AFB for a special event on Wednesday recognizing the Airmen who flew the HH-3 Jolly Green Giant! This aircraft flew rescue missions for four decades! The Air Force dedicated an aircraft, tail number 709, at the National Museum of the US Air Force at Wright Patterson AFB but what I saw were the people that cared for the old bird! As I looked around the audience the men and women were absolutely enthralled with the aircraft and as they listened to the guest speakers, I felt a chill realizing many of them knew someone who did not come back from a mission to save a life or pull a downed airman out of harm’s way! It was a cold day in Dayton but this aircraft was developed to fly rescue in Southeast Asia over the long distances required to reach our fighter/bomber friends ejecting over the hostile areas of Vietnam. In Southeast Asia the crews earned one Medal of Honor, twenty-four Air Force Crosses, and over 190 Silver Stars just during that conflict and many were in attendance at the ceremony! In fact, HH-3E 709 was flown by Maj. James E. McArdle, Jr.,(now Colonel retired) and his crew in 1979 during a peacetime rescue mission off of South Korea and earned the MacKay trophy, awarded for the most meritorious flight of the year by an Air Force person, persons or organization. If you would like to see more history of 709 please go to this National Museum Fact Sheet! 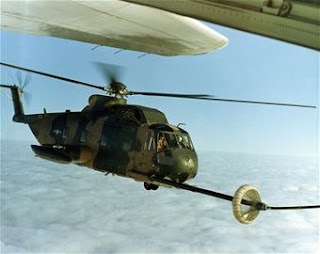 The first inflight refueling capable helicopter, the HH-3 showed its prowess by flying non stop from New York to Paris in 1967! The partially retractable gear and refueling probe and the professional maintainers made this aircraft an endurance challenge for the crews! I flew one mission for almost ten hours and many have flown longer ones and it just kept flying! During the ceremony, Lt General Donald C Wurster, the commander of Air Force Special Operations Command who began his career in HH-3s, spoke of the challenges of being an Air Force helicopter crewmember and how his officer skills were developed and toned by the commanders he had early in his career! Men who showed him the character and strength needed during these difficult missions but also for life! Maj General (Retired) Michael N Farage, represented Sikorsky Corporation, that designed and built this aircraft and spoke of the heritage of this company and its military ties! Still producing rescue aircraft such as the Air Force’s HH-60G serving in combat in Afghanistan right now the crews continue to excel at their mission, “That Others May Live”. I have worked with both men during my career and it was a certainly a wonderful opportunity to meet, enjoy old friendships and update folks on life’s happenings. I was blessed by flying 11 different aircraft in my career but the HH-3E was my squadron command and that gives it a notch! The 56th Rescue Squadron at Keflavik Naval Air Station, Iceland was where I became a squadron commander of Jolly Green Giant aviators, maintainers, PJs (pararescuemen) and their proud families as well! We stood out as an organization among the others because of our mission and the nations who sent their fishermen into the waters around Iceland knew we were there too! Lives saved during my command tenure included nationals from Britain, Iceland and Norway! During other years the 56th saved the lives of men and women using their HH-3Es from numerous other nations including Russia, Poland, Sweden, France and Germany. We retired the HH-3Es at Keflavik in 1992 and transitioned to the HH-60G. Crews from the 56th earned the MacKay trophy during a complicated weather related rescue after we left. Rescue missions always were flown as a high risk due to weather (it is never great weather when someone is trapped on a glacier), threats (the bad guys just shot down a fast mover is the reason you might be there), a sense of urgency for the injured/survivors and the time of day (most seem to get started as the sun goes down). But one thing the air crews could rely on was their aircraft like 709. The team of maintainers took such pride in their aircraft and at times worked in some of the worst conditions. 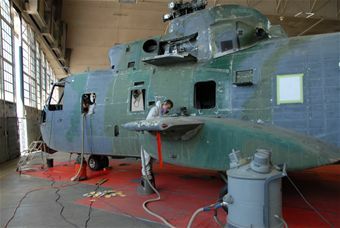 Replacing engines, rotor blades and other large mechanical parts in austere locations created a challenge that not many Air Force mechanics ever see/saw. The teamwork displayed is often unbelievable. Everyone wants to come back on alert, respond to the crisis or put the aircraft away before the unit Christmas party (which invariably leads to a launch for some poor soul in need of help). I flew for 25 of my 30 years and logged thousands of helicopter hours and the maintainers were the ones who did the dirty work, kept the aircraft safe and allowed us to get the mission done! A big salute to all of you! Now that 709 is part of the museum be sure to find time to stop in! Wright Patterson AFB is located at the intersection of I-70 and I-75! Military personnel travel those roads frequently and finding the right occasion for a visit would add to a vacation, a break during PCS or a family gathering! We took three of our grandsons for a visit last winter and they loved it! 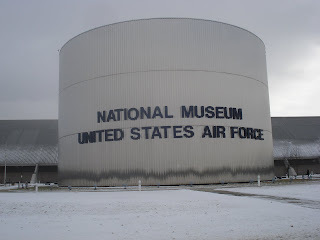 For more information on the museum please go to their website at the National Museum of the United States Air Force. A big thank you to the museum staff that put this program toget her as well! By now the decorations are up, the menu is being set, the cards and invites are purchased and stamps have been budgeted. Well, maybe in a perfect world. But the thought process has traveled down that project list. We hold traditions to keep the family on track as to what the family does: traditions help define family values and heritage. Some of these traditions can be left by the wayside without hesitation. I grew up in a Norwegian household. Lutefisk was always there on the table, but not anymore! Now I don't even know if it is available in Michigan where I live. Oranges and walnuts were stuffed in our morning stocking and often were thrown out with the wrappings. One firm tradition that my husband Dale and I held for our little family was moving. Oh yeah, rates right up there with credit card debt and paper cuts. However those orders did seem to arrive with a December move date a time or two. Change occurs and growth comes with it. We sought the adventure and the thrill of opening advent calendars on each side of the ocean. The new installation was like an unusual gift that had to be opened carefully. And we all did. The sharing of the adventure still lives on in our holiday celebrations that now include grandchildren. Life is good! Be ready to stretch that backbone, add new experiences and explore family and local traditions. Pick up souvenirs that will help recreate a memory. Picture yourself twenty years down the road describing the life you are living now, and holding firm to the fun of the moment. What will your children say their favorite tradition is? Learning a new custom at each new place they live? Encompassing the traditions of their parents and grandparents? Creating a new treasured value that they can carry down through the ages? Make that greeting card list and send your greetings to friends that are serving all around the globe. Bake cookies that you once made with your grandmother every year. Teach your children the customs of the country you are living in if you are overseas. And of course have a very Happy Holiday and a fantastic New Year. Ah December... family, shopping, baking, preparing, missing family & loved ones, advent, decorating, school parties, friends, squadron ... brigade... unit parties. It is a lot to take in over the course of one month. No wonder stress levels zoom this time of year! Have you taken time to laugh this Holiday Season? What Are We Sharing with Our Young People? What a great opportunity! I had been invited to talk to a high school government class about my military service and it turned out to be a fun time! My daughter-in-law Becky is a teacher (so is my wife and another daughter-in-law,). Becky had some high school juniors with a unique assignment to interview someone who was employed or had been employed with the US government. My military experience provided an opportunity to tell the kids about you, our military community! During the class I introduced myself and then they each had questions to ask! They asked some great ones! For example, what was the most traumatic moment you saw, would you serve again if you knew what you know now, how was your family affected, how much training did you receive and many many more! It was almost an hour of exchange at the end of a school day and approaching the Christmas break! Not exactly the optimum time but it did not faze them, they were intent! I found out one student was from the Democratic Republic of Congo, one had a brother in the Navy and several others had limited military contact with the military community. It was Pearl Harbor Day and I had to explain what that day meant! Many did not know what happened on that day in 1941 so we briefly talked about it! I told them about your sacrifices as military families, how many deployments you faced, what it was like to be separated for so long and miss family events together. Becky told them I had missed one son's birth (her husband) and we shared some humor as well. They were interested in the type of training, military benefits (at the urging of one teacher) and career tracks! I explained that the benefits were good but at the whim of Congress and never really to be counted on but the service life was so well worth it to me! Each student is tasked to write a report about the class and they all took notes! Four teachers listened to the class and one invited me to come back in March and talk to another class which is great! This is an opportunity and it is important to tell our young people about the military community! Thank you Becky! I must admit it has been a very long couple of weeks. BabyBoy *L* just turned 4-months and since around Thanksgiving learned how to *really* make his opinions known. He wants to be held. 24 hours. He wants to see the world around him. No time for sitting! He wants to play. Even when he is eating. In becoming more aware of the world around him he is sending me into a sleepless haze. I love all the parenting-articles out there ... oh sure at 4-months you can get them into a routine. This momma has tried. *L*'s routine is his routine. There will be no 'undue-influence' he tells me. His routine involves nursing from 8pm till midnight. His routine involves waking again at 4am ... not wanting to eat but to walk around. (Thank goodness for Dad who is more willing to walk then this Mom.) His routine does NOT involve Mom working behind the computer during the day. No way. No how. So I apologize for being a bit more AWOL then I would like to be. 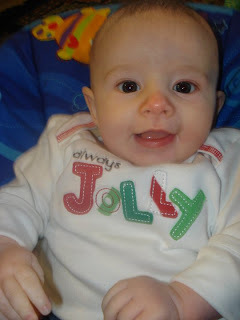 It was actually easier to get things done when *L* was a few weeks old, then it is a few months old! Whowouldathunkit? I think the hardest part for me is the 8pm till midnight feeding. I just want a couple of hours in the evening to /myself/ or better yet to myself and hubs. I get the two older boys into bed and then we snuggle into my bed and I turn the TV on, quietly, hoping he will be ready to sleep around 9. Never fails... he nurses from 8 till sometime in the later-11pm hour. By that time I turn out the light and am asleep in no less then 30 seconds. So from about 8:30 till 11pm my TV and I are evening-companions. I have waves of shows I watch and right now I am on a 16-and-Pregnant kick. I really shouldn't watch that show because it leaves me feeling so frustrated & down. These girls and boys usually start out so positive about their futures at the beginning of the show and after baby comes they are falling apart: the relationship, their emotions, the "family-unit". It certainly goes to show the toll a baby has on a couple. The show definitely doesn't glamorize being a teenage-mom. It does show the facts of life: she probably isn't going to graduate high school, the teenage mom and dad are probably not going to stay together, sometimes they can count on their own mom and dad... most likely not. I have a friend who had a baby this week. This is her third and it was with much joy that their little girl was born! In contrast, my teenage son also has a friend who had a baby this week. A world of different emotions for a 30-something Mom and Dad then a teenage Mom and Dad. I see all the posts on Facebook full of congratulations, excitement for this teenage couple, and yet I can't help but think, "What will become of them" ... I will pray, pray that they beat the odds! So tonight, as I once again deal with a little baby-boy who will have /nothing/ to do with falling into Mom's Routine I will say a special thanks for 'knowing': knowing that my beloved is just downstairs if I need him; knowing that someday *L* will outgrow this 'stage' (and I may just miss it! ); knowing that I come from a family of unconditional love... I am in a family of unconditional love... and this love continues to grow! 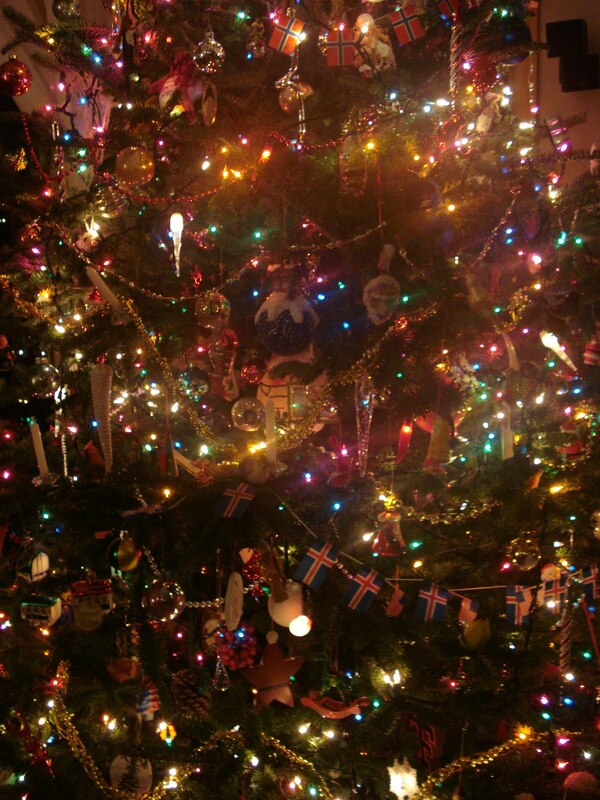 The tree has either been hauled out of the closet/basement/attic; or a new one has been purchase and is sitting in a bucket of water ready to handle the 15 tons of ornaments that your family has progressively added to each year. Even the kitchen towels have been traded out. No more jack-o-lanterns or fall leaves. Now snowmen and Santas are living in the drawer by the oven. Toasty... that just sounds wrong! The china cabinet displays Spode Christmas Tree pattern plates, bowls and green depression side dishes are in view. We live in a green and red mecca. A few nights ago, 5 year old grandson had to show me the soaking wet pile of Snowmen towels on the bathroom floor. "Look, they are melting..." I suppose that is a good reason not to hang them up! How could anyone? 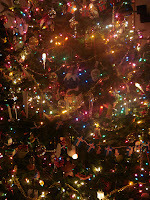 These decorations fill the house, and are there throughout December. But there comes a night when the table will display the warmth, the joy of anticipation, the abundance of blessings and work that brings us together: The Christmas meal. And it is always a good one! This year I have dug back into the recesses of my mind and pulled up one of the best ever: Pepper crusted Prime Rib. No one on Earth could make this like Dorothy (Mom). But maybe that is because I could see her, talk to her and hear her voice.... Isn't that part of the holidays? The memories? Prime Rib is as good as the cut of meat that you purchase. If you are going to go this route, it is wonderful, but don't take a cheap cut. The prime rib cut is the bone in beef cut from ribs 6 through 12 that contains a bit of gristle but is full of flavor. Do not confuse this with the Prime grade of beef. Prime rib is the location, not the grade. Opting for a prime grade assures you that there is marbled beef, and at least 8% is intramuscular fat, the reason it tastes so good. Only 2% of all beef graded by the USDA qualifies for the Prime distinction. If you find this cut at the commissary, and I did at Selfridge ANG commissary... pick it up and know you have a prize! In small bowl, whisk peppercorns, Worcestershire sauce and mustard. Spread over the surface of the fatty side of the meat. Place roast on a rack in shallow metal roasting pan. Cut off the top of the whole garlic, keeping it in tact. Place on a square of aluminum foil. Drizzle olive oil over cut side. Bring foil up to enclose garlic. Place next to roast. Place onion in 4 corners tucked under roast. Bake 15 minutes. Reduce oven temperature to 350; bake 40 minutes. Remove only garlic from pan, set aside to cool. Continue baking meat for 1 1/4 more hours. Insert meat thermometer...not by a bone. When it registers 135 degrees, for medium rare and remove from oven. Meat will continue to cook. (If you have a cut of meat that has had the bones removed, bake until thermometer registers 140 degrees before removing from oven.) Transfer meat to a carving board and cover loosely with foil. Put the roasting pan on a medium high burner. Add bouillion cubes and 1 c water. Smash cubes to dissolve. Stir up browned bits of the roast. Add red wine and discard the onions. In a small jar, or plastic shaker, add flour and 1 c water. Shake in jar to combine into a white mixture. Bring pan drippings to a boil, add the flour and water mixture stirring continually so that clumps do not form. Pour into a gravy bowl. This gravy will be thin. Use the soft roasted garlic for garlic mashed potatoes. With fingers press soft roasted garlic from each clove, discard skins. Stir into pot of prepared mashed potatoes. Call loved ones to the table! Time to celebrate! Create a MilitaryAvenue Answers Account today! • What is housing like here? • Where are the best school there? • What is your experience with living over there? • Where do I need to go to get this done? • Where can I find the best coffee... fine dining... theater... on the other side of the gate? All questions that a little bit of help from your military- & community-family can get you on the right track. Have you visited MilitaryAvenue Answers lately? We have quite a variety of Questions AND Answers! Scroll through previous question by Location or by Category. Look through our list of unanswered questions to see if you can help a military-family. Ask your own question! Sign up to be an Expert so that you can learn of new questions right away! Start your own conversation today! Technology is Saving Our Troops Lives! They come with names like Wolfhound and Duke! Sounds like the family pet but these names are lifesavers for our troops and they show how technology can save lives! MilitaryAvenue met with Colonel John “Buck” Surdu, military deputy for the U.S. Army Research, Development and Engineering Command, Communications-Electronics Center (CERDEC) during the DoD Roundtable as he excitedly described the capabilities of new equipment in the field. The colonel was pumped about saving lives and you could tell he was proud of his team’s efforts supporting the warfighters! So what is Wolfhound? Much like the famous dog this equipment has a great sniffer! In fact, it electronically sniffs for the bad guys and tells our folks where the bad guys are operating in the electronic realm! Carried in a backpack, it can find electronic signals and point at them and provide the location of cell phone use, radio traffic and even IED locations to our troops. How did they do it? Off the shelf, commercial technologies formed the basis of Wolfhound and it is one of the top ten inventions identified by the troops this year as important for their mission success! Now tactical decisions on engagement, timing, intelligence gathering, etc can be made! The hunters become the hunted very quickly with the Wolfhound! We all want and pray for a practical bubble of safety to be placed over all of our troops but the next top ten technology winner, the Duke, physically/electronically does just that! I am such of John Wayne and this device is something his moniker should be proud to share! The Duke, is an electronic IED jammer that stops the controlling device so that troops can safely pass by an IED while the bad guys try to setoff without success! A joint Army/Navy project Duke has an agility to respond to frequency changes, measure effectiveness and locate IEDs! It sounds like Christmas bubble wrap for our military families! More of a workhorse than the first two and without the cool name, the REPPS, Rucksack Enabled Portable Power System, just saves the backs of our folks patrolling in the mountains of Afghanistan! One of the heavier items in a rucksack is back up batteries! This solar system allows the batteries to be recharged while in remote locations so that the folks can carry less of them! I like that idea too and can think of a lot of commercial applications as well! It can even recharge the batteries while they are being used in a radio! Solar power can not provide the type of power required for the radio but by keeping the batteries charged the systems stay operational, less weight for batteries and our troops are again safer! Colonel “Buck” was obviously an advocate for the troops! Outspoken, candid, he was not afraid to be open about the impact of possible forthcoming budget cuts on the development of technology like these soldier saving devices! If you want to hear cut through the bureaucracy, straight to the heart of the matter, please listen to the audio of this Roundtable at DoDLive. I hope the public affairs officer sitting next to him did not go into cardiac arrest but it was such a refreshing discussion! Thank you Colonel! You can also find a written transcript there as well! Our Letters to You has more information on Afghanistan if you would like some interesting reading and perspective! DoD Roundtables include numerous subjects such as Operational Stress Control, Current updates on military programs, military family issues, plus much much more! Browse and enjoy! Photo Credit: Col. John "Buck" Surdu, military deputy for the U.S. Army Research, Development and Engineering Command, communications-electronics center. Photo courtesy of CERDEC. Are you feeling “stretched” as the holiday season and Christmas arrive? Do you have enough energy to bring the stretch of stress under control? Is your military family resilient? During 30 years of service and then retirement and watching a daughter with her husband in Iraq we have seen a lot “stretching” and it was great to hear Captain Lori Laraway, coordinator, Navy Operational Stress Control Program, talk to the Blogger Roundtable about means to help return the stretch to your rubber band of relationships, mental health and tools to keep you resilient! Are you in the Red? Green? Yellow? Orange? I so like this way of identifying how folks are feeling and where they are at in the need for care! The OSC Continuum provides an easy communication tool for folks and helps them recognize where they are at while balancing the challenges of life! Especially military life with numerous deployments, another holiday season missed, single parenting workloads, dealing with teenagers while they also feel the stress of missing parents and fears for their safety! I remember one winter weekend some time ago returning home from a long series of TDY/TADs and realizing my family was definitely yellow as described by Captain Laraway and edging toward orange! Three teens/sub teens and mom were definitely tired and dad was worn from traveling! Stress between siblings was at a high mass and ready to erupt and we needed a break! Thankfully we recognized that we were stretched and a weekend getaway was in order! We went 10 miles to a hotel with a pool, on the beach and relaxed! The laughter that filled the air released the tension and allowed us to take away that tension! Our “bands” were relaxed and we returned to the green! But how do you find help to grow that resilience that military members and their families need? The Navy OSC program has been taught to 176,000 sailors, family members and health care providers according to the captain and now includes print materials, video and a growing social media presence through their Facebook, blog and twitter accounts! Reaching out to where the sailors and their families are at! Also, they have developed specific curriculum for family members and connected with training materials provided by the Fleet and Family Support Centers! The materials are available in American Sign Language and Spanish as well. The Captain has two young adults and stressed when they were teenagers the color codes provided a great way to communicate how they were feeling and opened the door to further communication! It is easier for an upset teenager to say I am “yellow” or “orange” than to explain why they feel bad. 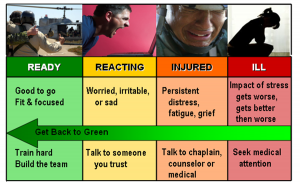 But once they tell you they are stressed the door is open to help them relieve the stress and return to the “green”! Want to learn more and how to use the continuum to build resilience? Go to Navy Knowledge Online! The best part of online training is that it is accessible at long distances! Commit to taking the course as a family, tell your friends about it and spread the word! Are you are a reservist a long ways from a FFSC or military facilities? With access to a computer you can reach many of the same resources as active duty personnel! But what if you stray into the orange and bubble into the red? Do not wait for help! Seek help through the medical community! Concerned about the impact on the military job? Security clearance? Captain Laraway said that unfortunately there is still a lot of misinformation out there concerning those who seek and need help and the impact on security clearances! She pointed out that it is extremely rare for mental health issues to impact a security clearance but that many of the by products of being in the red such as financial problems, legal issues and domestic violence very definitely do! The military culture of independence and self-reliance is a difficult one to overcome but through training and helping each other out it can be accomplished! If you need help please contact your medical professional today! Not sure where you are at in the stress continuum? Talk to a friend or go to a chaplain! Chaplains were a rich resource of information (and totally safe as they are protected from disclosure without your permission) during my career and not all of it is spiritual. Many are trained counselors and can help point you to the right resource for your needs as well! To listen to this great Roundtable or get a copy of its transcript go to DoDLive! Here is a great article on OSC posted on MilitaryAvenue written by Navy Lt Jennifer Cragg from Emerging Media, Defense Media Activity as well! I am in the green today and I hope you are too! Photo/Image Credit: Captain Lori Laraway, coordinator, Navy Operational Stress Control Program. 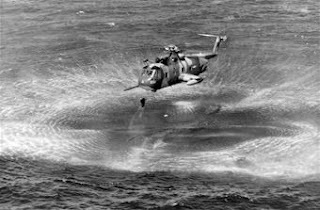 Photo courtesy of the U.S. Navy. Renting or Buying? How to Make that Decision during a PCS! As we get ready to celebrate the Holiday Season, military families know what the next “season” is going to be! “Waiting for orders season” for about one third of us each year and most orders arrive in the late winter/early spring for a summertime PCS! Unless you were the Kissingers, who seemed to get a lot of “you will appreciate this assignment”, so don’t complain about the 2 week notice type of orders. But with the PCS comes the difficult issues of what to do about housing! Certainly tough choices for a military family and we thought it would be a timely subject. MilitaryAvenue has a long standing relationship with USAA so we went to one of their experts to discuss some ideas of when to rent or buy! We have a lot of experience of our own with 18 moves in 30 years of service but thought you would like to hear from a specialist as well! Rich Novak, USAA Assistant Vice President Home Circle Integrated Solutions, agreed to pass on his insights to us so we could share them with you! Rich is a former Scout Helicopter Pilot with the Maryland Army National Guard. With a Masters Degree in Business Administration he has been employed in the real estate finance industry with several major companies and has been a USAA member for 20 years. We talked about flying first and then jumped right into what is the #1 decision point for renting or buying. While difficult to narrow to one point, Rich said that the time you expect to live there is it! Two years or less, rent is the best option! But even if expected to have a longer tour think about the potential impact of early orders (yes, the Kissingers when deciding to buy homes, had that happen twice on “long tours”). If the market is a difficult one, can you sell? Have you thought through the “what ifs”? Make a list of them and see how they impact your decision! What if we have to sell and can’t? Rent our home? Loss of BAH housing due to orders, can we still pay the mortgage? How much is property management? So many things to think about! One great article on MilitaryAvenue provides some great resources during this process! “MilitaryAvenue.com Resources: Buying a Home” This article has some great rules of thumb, other experts and experiences of military families, mortgage ideas, tax advantages, the DoD Expanded Homeowners Assistance Program (HAP) and much more. MilitaryAvenue has a Moving Tools tab as well with great resources for your use! Of course, money is the key to this decision but we want schools, pride of ownership and stability in our often tumultuous lives as well! I asked Rich, if USAA had tightened the criteria for a mortgage loan? He said that the rules were set by government lenders such as the VA, FHA, Fannie Mae and Mac and that USAA had to comply but they were best at assisting the military family with their vast military experience in the housing marketplace! I agreed with Rich that “USAA goes the extra mile” to help its military members find their way through the paperwork and other necessary evils of home buying/selling/renting. The new USAA Home Circle program which launched in August is the first step for a military family seeking to do research on home buying or renting! The major topic tabs are Buying, Selling, Renting and Owning! I am thoroughly impressed that renting has been added as a necessary tool for military families during this market downturn from USAA! The housing market downturn has been much worse in some locations than others! How does that impact your decision, was my next subject for discussion with the expert and he said it definitely mattered! Rich grew up near DC and described that marketplace as strong with a stable rental market. Frequent relocations caused by government turnover impact that market and make it easier to rent a home if you choose to do that after living in it during your assignment! Other locations with large military populations such as Norfolk, San Antonio, Southern California and the Puget Sound area might also meet the criteria. But as Rich pointed out, are you ready to handle the worst case scenario in any location? Can you cover the mortgage after receiving the next set of PCS orders? Are you ready to leave the family in place till the sale/rental is complete? Have you looked at property management costs, if you do rent your home? What is your exit strategy? Do you plan to retire in the area and come back to the home later? All good questions to add to that decision point! Avoid the pitfalls, become smart about the area before buying! The biggest pitfall of home ownership according to Rich: Inability to sell a home or find a renter that can cover the mortgage cost for you (don’t forget to subtract those property management and maintenance fees). Our personal experience after an overseas tour that included owning two homes, two college students and getting PCS orders was a nightmare and the fees from our property management team started really hurting! Be sure to check them out thoroughly and demand an accounting of their expenses in the contract! We found out that many of the projects that they said needed to be accomplished on our rental home were being done by a “brother in law’s” company! Hard to watch from overseas so the right company can be critical! Don’t be lured into buying by emotion or persuasive folks! Make a fully informed housing decision, do the research and enjoy your home! When is the decision “absolutely must rent”? How long are you planning to be there is the decision point again! Less than two years! Rent! Rich reminded me, when you buy a home the fees are usually paid by the seller! So what looks like a good deal up front may not look so good two years later! Your sales price must now include that sales commission (6% usually), finance fees, title fees, inspection fees, repairs, upgrades to help market, etc. etc. and I do mean etcetera, etcetera! They just keep coming and after so many military moves it is nice to have purchased a home and watch the mortgage payments increasing equity instead of trying to just cover those costs of home ownership! What should renters consider? How much can you afford? Pick a place that meets your criteria for lifestyle, commuting distance, affordable, are utilities included and again Home Circle has a renting tab to help you decide! Home Circle has a search tool, sources for rentals, can you be used with an iPhone and has a save function so you can go back to review houses of interest! Also, do you remember the USAA MoversAdvantage program? Some of those realtors will help you find a rental as a free service! Not a member of USAA? You can expect the Home Circle application to be more easily found outside their firewall by early next year according to Rich! Even though it is a new program, all the USAA employees have been trained on Home Circle and will be there to help with your questions! Ready, Set, Move! Please let us know if you found this informative! We want your next PCS to be smooth and as stress free as possible! Thank you Rich for your service and support to the troops! We are blessed at this Season to have folks watching our backsides at home while our airmen, soldiers, sailors, marines and coasties are in combat! The Season of Advent: "The rest of my decorations are just that... decorations. But our advent calendar is part of the story-board of our lives." The Three Wise Men: "We are going to take the joy-filled emotion out of the packaging, paper and toys that we would otherwise be tripping on till they fell apart... and putting it back to where it belongs." Can you believe it is almost Thanksgiving? Oh what a wonderful time of year. A time set aside to think about thanks, giving thanks and filling the mind, spirit, belly and arms with fantastic treats! Our treats start arriving on Wednesday and the locals on Thursday. The smell of cleaning is strong in the house today. So strong that I just had to add some cinnamon and spice to the mix. Silver polish is great stuff... but when the trays and forks are shining and sparkling... it is time to dazzle the taste buds. In late September we went apple picking, and bought extras just for Thanksgiving get together. Leanne is bringing the apple pies, Penny will bring an apple slice tray, so I am making some slow cooked apples to top the morning's waffles. And for a sneak preview tonight.Splenda brown and white sugars are used as sweeteners for the diabetics in the crowd! Is there anything that we don't treat ourselves to at this time of year? Abundance is noticeable. Things have been put away, kept on hold until the holiday arrives. We are ever so thankful for that ability, and most of all for the friends and family that will be here to share. I hope your table is full too, of people and scrumptious dishes! 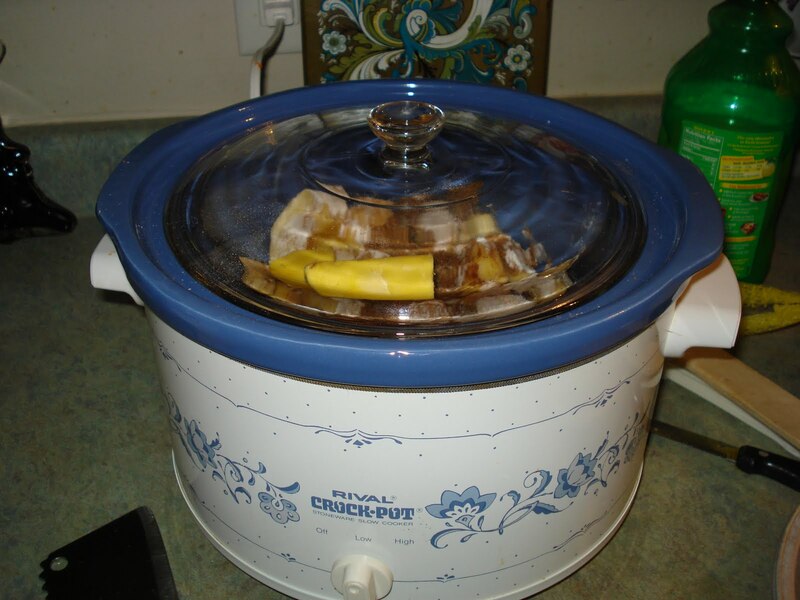 In a crock pot add the apples and lemon juice. Stir to coat. On top of this add remaining ingredients. Put lid on cooker and allow to cook at low for 3 hours. Stir occasionally during the cooking. Use on top of breakfast food, or as a chunky applesauce. Great hot or cold. It is that time of year! Travel plans have been made. "To-Do" lists have been created. Families are getting together. As you gather around the Thanksgiving table this week pledge to remember our families with service members serving in Iraq, Afghanistan, Africa, over oceans, in the air... many places, far, far from home; many spouses far from the other half of their heart; many children relying on one parent, when they would much rather have two hands to hold, another set of arms to wrap around them; many moms and dads missing the little boy and girl they raised into fine men and women! Pledge to remember these people as you bow your head before partaking in your feast. Pledge to thank God for their sacrifices and then thank God for their families. When someone asks how they can pray for you . . . I've done Thanksgiving without my soldier and I can assure you it was one of the hardest holidays without him. Be sure to take the time to encourage and lift-up a military-family this week! I love the Thanksgiving Season! The sights, the smells, the colors, the sounds. If you are looking for a distinctly-delicious breakfast snack for the holidays this is for you! Preheat the oven to 350. Butter and flour or spray with non-stick cooking spray 12 muffin cups. Make batter: In a medium bowl, whisk together flour, baking powder, baking soda, salt, nutmeg and allspice. In a small bowl, whisk together buttermilk and pumpkin puree. In a large bowl, using an electric mixer, beat butter and brown sugar until light and fluffy. Beat in eggs, once at a time, scraping down bowl as needed. With mixer on low, add flour mixture in three additions, alternating with two additions pumpkin mixture, and beat to combine. Spoon batter into each muffin cup and bake until a toothpick inserted in center of a muffin comes out clean, 30 minutes for regular muffin size. We also like 'mini-muffins' (pictured) which took about 12 minutes to cook. Meanwhile, combine sugar and cinnamon in a bowl or a ziplock-bag. Let muffins cool 10 minutes in muffin-pan. * Working with one at a time, remove muffins from pan, roll in butter, then toss in sugar mixture. Store in an airtight container, up to one day. These muffins will melt in your mouth! Since I do not plan to eat all of them in a day (although very tempting) I only coated half of them in the sugar mixture. The rest I will freeze and bring to my parents' where we will be celebrating Thanksgiving. This will be a perfect breakfast snack! The Debt Commission Proposal - Do They Know We Are Fighting America's Wars? I don’t usually write blogs about subjects that make me mad but the recent efforts in Washington to find federal budget reduction items just got my dander up! Why? Because they fall square on the back of military families that are at war! I try to keep up with events that affect our troops and their families and this one is at top of the light pole for me! Have you heard of the commission put in place by the President, called very appropriately, The Debt Commission? Actually, its full name is the National Commission on Fiscal Responsibility and Reform and it has a website at http://www.fiscalcommission.gov/ which outlines its charter which it is to identify government programs that need to be cut to reduce our federal governments spending – a very worthy goal, except that the commission takes aim directly at those currently serving and those who have served! Now this is the beginning of the process but listen to some these proposals affecting the military community! Ready? Very inappropriately, this was released the day before Veteran’s Day! And it is Military Family Appreciation Month as declared by the President! 1) “Freeze federal salaries, bonuses, and other compensation at the Department of Defense for three years”. Yep, you are reading this one right! Our folks in combat are going to lead the way as the first item by having their pay frozen! This reminds of the late 70s when there was a three year military pay freeze with annual inflation rate of 14-15%! So military families were losing money every year! At least President Carter and congress waited for the Vietnam War to be over before freezing military pay! 2) “Modernize Tricare, Defense health” which includes additional fees and copays to match other health care programs! Remember the claim that the National Health Care plan was not going to go affect Tricare or Veteran Health Care! Modernize in the context of debt reduction/spending reduction means less serviceor more cost for our injured, retirees and military families that sacrifice so much! 3) “Reduce spending on base support” and “Reduce spending on facilities maintenance”. That is where we live folks! Reduced MWR programs, road repair, housing, hangar repair, etc. While the nation addressed and received stimulus funding for repairs to state and city infrastructure, yours is going to be cut! 4) “Consolidate the Department of Defense’s retail activities”. This is the Base/Post/Naval/Marine Exchanges and the commissary system! Looking for ways to reduce the budget? Let’s target those support agencies that are the lifeblood of the military family! Sure, they talk about just saving overhead but as in any consolidation where do they draw the line on savings. Increase the cost of shopping for military families is an easy target! I picked out the items that were directly targeting items that will impact you, the military family member but there are many others and the estimate for savings at the Department of Defense is $100 Billion over the three years. Now the fact is that this is a draft proposal and it has to go through the Congressional review before it could be included in any budget! But another striking figure is that the budget reduction for the rest of the country’s federal programs is also $100B! Not exactly a fair balance of sacrifice for the military community! But here comes some more impact as you approach or are at retirement age! 1) “Reform military retirement system to vest after 10 years (not 20); defer collection until age 60." The military retirement system is a deferred payment plan for the sacrifices that service members make every day! As the politicians who made these recommendations head off to celebrate holidays with their families and friends, our military personnel and their families face yet another long year of deployments and separations. Makes me wonder if any of these commission members ever served in the military and particularly during wartime! 2) “ Reform COLA payments for civilian & military early retirees”. Reform is key here! The Debt Commission is looking for ways to reduce cost! Do you think reform means more money in your pocket? I doubt it seriously. Again, these are just proposals but the Department of Defense is such an easy target! How can they target our service men and women and their families without addressing the entitlement programs of all Americans! Think of the possible savings there! If we are going to sacrifice then let us all do it! Let’s share the burden! Military families recognize the need to save and reduce the budget but why do we have to do it alone! If we are going to freeze pay for one group – do it for everyone! There is no mention of freezing congressional pay, travel or other perks! Another possible target would be federal payments to the states! States live on federal dollars, reducing their budgets (ie California) would reduce the federal cost as well! That would affect all Americans equally! So what do I recommend for you? Are you a member of a military organization such as the Military Officers Association of America (MOAA), Non Commissioned Officers Association of America (NCOA), American Legion, Veterans of Foreign Wars (VFW), Reserve Officer Association of America, Air Force Sergeants Association, Fleet Reserve Association, Navy League, Air Force Association, Association of the United States Army (AUSA) and some that I am sure I missed? Write them and ask them to address these issues! Write your congressperson and senators! Military voters are spread out and not a bloc voting group but our politicians are sensitive to reducing military programs in war time due to the impression it has on other voters! Tell them you are interested in a response and want to know how they vote on these issues! We are defending our country this very minute and we deserve better than what the Debt Commission proposed! I spoke to heroes during this Roundtable! 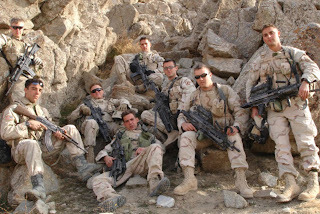 They defended us in a remote valley in Afghanistan and in the mountains around it. They fought a battle there on October 25, 2007 that resulted in the death of friends, injuries, moments of fear and terror. The responses of one man to the combat situation he found himself in earned him the Congressional Medal of Honor! Staff Sgt. Salvatore Giunta is the first person to receive the MOH since the Vietnam War who could receive it in person from the President. There have been others who received our nation’s highest decoration in our wars since Vietnam but unfortunately they were posthumously presented to family members. 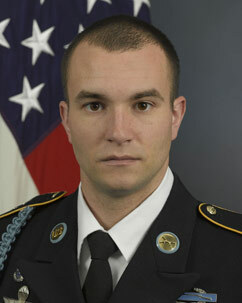 Staff Sgt Giunta, Staff Sgt. 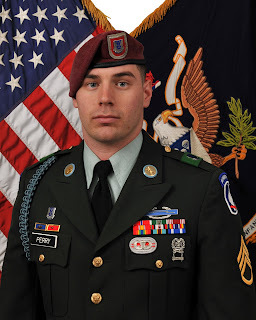 Brett M. Perry, Staff Sgt. Michael Burns and Staff Sgt. Erick Gallardo were all members of the B (Battle) Company, 2nd Battalion, 503rd Airborne Infantry Regiment, 173rd Airborne Brigade Combat Team, V Corps, Vicenza, Italy deployed to Afghanistan and were brothers in arms. They lived together, went on patrol together, talked only as men who have seen combat together can, shared an “unspoken bond” and they traveled to DC to be with "Sal" (Staff Sgt. Giunta) when he received his Medal of Honor on Tuesday from the President. They had a private reception after the medal presentation with the President and the First Lady who they described as likeable and friendly – genuine. But the Roundtable asked questions about the events of three year ago, how did they feel about their friend’s recognition for heroism, did they still find him approachable, were there changes in how they dealt with each other, future plans and more. The three soldiers described a whirlwind of emotions around the White House and other events honoring Sal including comments about a party thrown that was a great time! 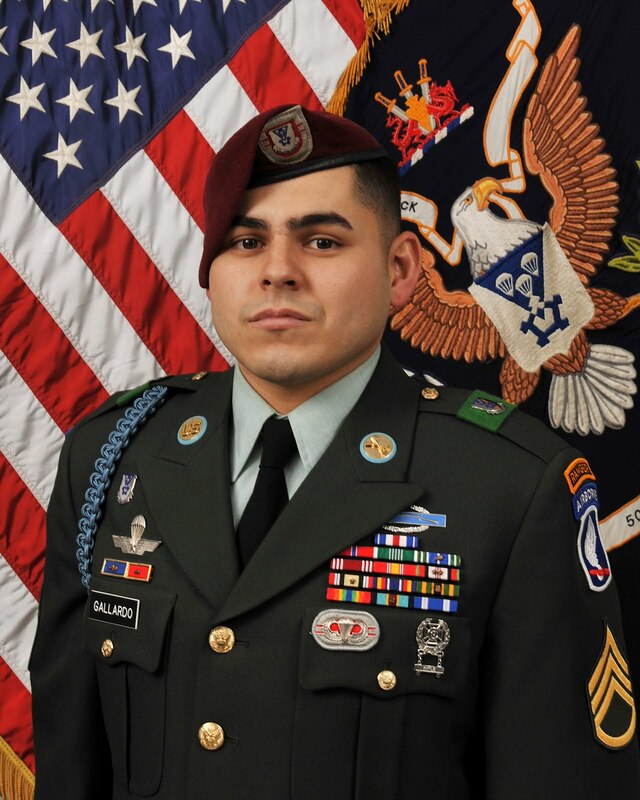 Gallardo who was injured and dragged from the kill zone by Sal led off by comm enting on the genuineness of Sal. He said he was not a character, a real family man with an Army strong military spouse, Jenny. Perry said Giunta did not want to be in the limelight but knew it could be inspirational for others. When asked about lessons learned from this experience, they all thanked the men who trained them and how they followed the Army doctrine – “went by the book”. They felt it could have been a lot worse if they had not been so well trained and that their responses were ingrained in them during a situation that was chaotic on a spur between two valleys. The Taliban knew they had to come down the way they had done up and set a trap. During the firefight that ensued they fell back on their training and that it saved lives! I would add heroism to the mix of reasons they survived that day! During that night fight in the Korengal Valley Sgt. Joshua C. Brennan and medic Hugo V. Mendoza, died of their wounds. Five were wounded during the fight. There have been 42 Americans killed in this part of eastern Afghanistan including Navy Seals, aircrew and soldiers responding to fights. Thank you for serving and a grateful nation honors and respects you! 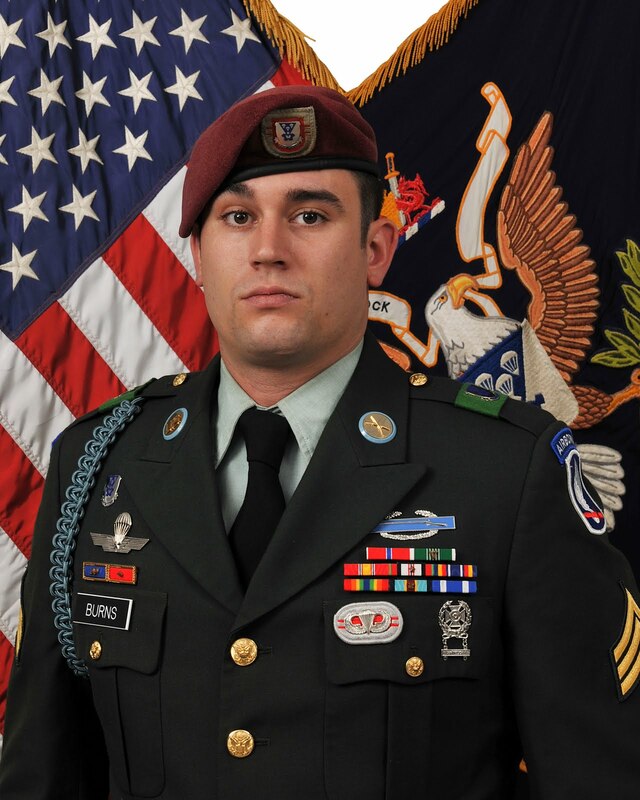 Our salute to Staff Sgt Giunta who stated, "If I'm a hero, then every man that stands round me, every woman in the military, everyone who goes into the unknown is a hero." Humble for sure, the epitome of our service men and women! To listen to this interesting and informative Roundtable be sure to go to DoDLive and if you are interested in other blogs about Afghanistan please go to Our Letters to You from MilitaryAvenue. Autumn has fallen upon us with force. Halloween decorations have been long put away and thoughts of Thanksgiving meals are upon us; followed quickly by Christmas lights, gifts and carols. My family will soon pack up the minivan to drive 'over the river and through the woods to Grandmother's house we go!' A long-weekend with my parents, siblings and nieces and nephews. But that is just a piece of the 'Thankgiving Tradition'. Some years we do Thanksgiving with my husband's family which involves his grandmother and all of her siblings and their families. It's a HUGE gathering! In many ways Thanksgiving 'tradition' is an oxymoron for the military-family - EXCEPT that it involves time with folks that we care about, people that we want to be with, and time spent being thankful for what we do have. Our family is growing. The latest addition is my beautiful baby-boy born in August. My brothers have children and one has twins due after Christmas. We are no longer a family of five gathering around the Thanksgiving table but a family of 15! Plus, this year one of my dad's brothers and family will be joining us for a grand total of 22. That's a lot of cooking for my mom. As I grow up (I'm still doing it at 36!) I'm learning to enjoy cooking, too. So I found some recipes that looked good and told my mom I wanted to try them. I have picked up the necessary ingredients and put them in a bag to bring with us 'over the river and through the woods'. It takes a bit off of her plate and puts me in the heart of action as well. What can you do to help with festivities? If you are hosting have you delegated? If the stress of planning and making a big meal is spread out among many it makes it more fun! Another point is there is more to Thanksgiving than the food. There is family and friends. Perhaps you can organize (or delegate) some things for the kids to do to keep them out of the kitchen and pulling on Mom's 'apron-strings'! What about after dinner, plan something for the whole group to do; a nature walk, a tour of the town for out of towners, perhaps a fun game to enjoy each others' company. Everyone can be involved in the planning and it helps build anticipation for a day of Thansgiving! After the Thanksgiving leftovers are all done, the turkey, pilgrim and other autumn decorations are put away, around the bend comes Christmas, Hannukah and other traditional holidays. December can be one of the most stress-filled months of the year. But it is not supposed to be. It is supposed to be about family, blessings and small gifts of joy. A little /too much/ merriment? >> Here are some more great traditions from military-families: What are your Holiday Traditions? I hope that as this season of thanksgiving and friends & family descends upon us that you will take the time to remember what it all is really about. The moment it becomes more about stress and less about joy you need to take a step back and see how to change directions! Over the river and through the woods is a great direction for our family! 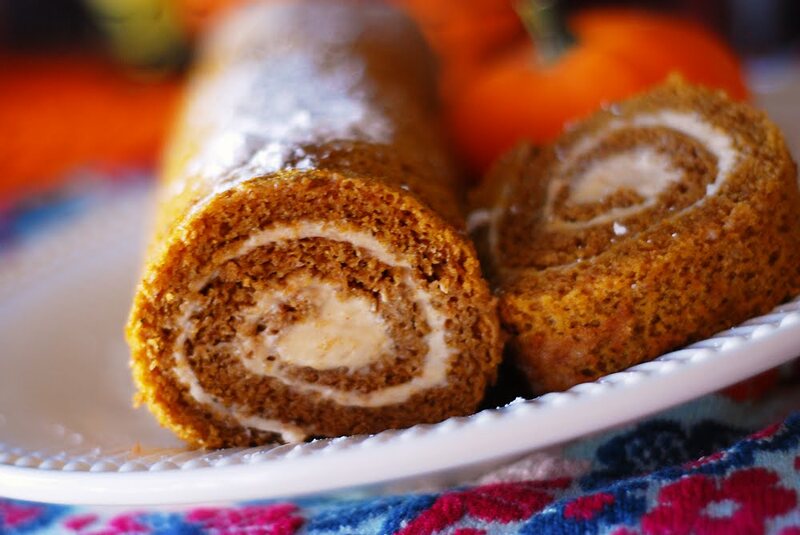 Who knew making Pumpkin Rolls could be so much fun?! It was an incredible way to break up the monotony of the week for me (Is it really only Tuesday?) Hubs has been working late nights and of the last seven nights he has been home at the boys' bedtime twice. I have a nursing baby. Plus both boys, E and C, have a pre-Thanksgiving project for school that is extending homework time. On top of it all, I haven't been as good about getting dinner started early. To say last week was exhausting is an understatement and yesterday just capped it off. But today is a different story! I feel so much better having spent some time learning to make new food in time for the holidays. My mom-in-law held *L*, 3 1/2 months, while she told me what to do, which will help me retain it when I try to do it again myself. We didn't have any deep meaningful conversation but it was just a gift of her presence that made the morning enjoyable! If I messed up she shrugged her shoulders and said, "That's ok!" and told me what to do next time. She didn't take over. I asked questions along the way. Life was good. A few girlfriends of mine keeping talking about getting together and making pasta! Won't that be fun?! I've never made that either... I'm always up for an adventure! Now we just need to make it happen! We had a wonderful Veteran’s Day including sharing part of my day with a grandson and his kindergarten classmates, my son took our car to a company offering free oil changes for veterans, connected with Facebook family and friends thanking us for serving and topped it off with a great dinner at a local restaurant that gave us a veteran discount (Seasonal Grille in Hastings, Michigan and the food was wonderful)! It was quite the day and then I sat down to write about the Department of Defense Roundtable I had participated in on Wednesday! It was a like a cold bucket of water being thrown in my face – ok, back to the real world of veterans dealing with PTSD and TBI (Post Traumatic Stress Disorder and Traumatic Brain Injury). This was the best DoD Roundtable I have been part of due to the participants open discussion about tough issues for veterans! Retired U.S. Army Maj. Ed Pulido and Capt. Josh Mantz, Real Warriors Campaign, Defense Centers of Excellence for Psychological Health and Traumatic Brain Injury (DCoE) and Ken MacGarrigle from the VA's Operations Enduring Freedom and Iraqi Freedom Program Office spoke to us about their personal experiences and why it is critical for early intervention for service members returning from the battlefield with these problems. They did note that “honoring” these protectors of our freedom with special recognition such Veterans Day celebrations, events such as last week’s “Stand Up For Heroes” and welcome home atmosphere were critical in the healing process! They compared the current treatment of veterans favorably to the treatment of Vietnam era veterans. DoD campaigns and information are getting better and access for those who need help is readily available. What is the most common misconception for PTSD, TBI and Deep Depression? All agreed that “you can not get help” is the biggest problem for many! That PTSD is a stigma and the events that caused it just won’t go away! Expectations are key according to Captain Mantz and he said that PTSD is managed but not cured. They felt that the military community has made strides to reduce barriers and the stigma attached. There is no “magic pill” to cure those with PTSD. But is it PTS or PTSD? Quite a discussion occurred over being identified with a Disorder versus just Post Traumatic Stress? Captain Mantz thought that having Disorder on the end gave it a very negative connotation! It was not a medical issue for the name but for a soldier (or any service member) it can cause issues to be identified with a disorder. He felt it made the situation more normal in soldier language and mentality without the D. “I think that from a soldier's perspective, not a clinician's perspective, but from a soldier's perspective, calling it post-traumatic stress kind of defines it in a way -- and normalizes it a bit.” It seems that DoD might consider changing to PTS if that helps service members better deal with their mental health after returning from the battlefield! Three therapeutic requirements for returning veterans: Individual counseling and services for the service member; second, peer to peer support systems and third community outreach through faith based systems, schools (opening doors to veterans on Veteran’s Day to tell their story is a great one) and other welcome home venues. But what about veteran’s families? The first line of defense according to the team! Spouses and families also need counseling and it is available according to Mr MacGarrigle at Vet Centers around the country! Spouses are critical to efforts and I think I will write a second blog about this particular part of the Roundtable! Here are some great resources for you! Whether they are for yourself, a family member, a friend, a peer, a community group that needs more information or anyone that you think could help spread the word about veterans! Director o f the VA, General (ret) Eric Shinseki: "Instead of waiting for veterans to find us, we're going to seek them out where they already are -- which is, increasingly, online." I am a friend and follow this one! There is a locator on the home page to find the closest one to you! Community based! This Roundtable was a great discussion and an audio is available! I would highly encourage you to go to DoDLive for an audio or transcript! Thank you to all of veterans who have served! It is not just a day, it is every day!